When you hear the word Pamir, what comes to mind? Stark, skyscraping mountains? A remote and exotic land? I have to admit that I had no imagination about this place that we are in the midst of passing through before we got here. But still I was surprised by what I encountered. Cresting the 4280 meter Kyzyl Art Pass, we barely rolled downhill onto the desert plateau which is the eastern Pamir. The colors were captivating- golden sands and russet rocks. The stillness and emptiness were even more so. A turquoise lake, our home for the night, turned muddy by morning with the inflow from the unseen glaciers surrounding our bed. Only horseflies stirred, and they made me mad, dashing headlong from their hungry conspiracy. Chris had to laugh as he watched my torment. Slowly riding in the thin, high altitude air I had to wonder at this lifeless place. What was the grand appeal that drove the adventurous to hitch or cycle or hire a jeep to tour though this unpeopled land? Our constant companion was the Chinese border- delineated by a complex but tidy array of barbed and electric wire, and thick fenceposts in an unforested, unvegetated desert. We entered over the high pass of Kyzzyl Art. On the other side, stark in barrenness. Dry. High. Windy. Colored sands and rocks: brick, ochre, gray- pyramids rising up and tumbling down. Dust devils reaching 300 feet high, disappearing as fast as they form. All against a brilliant blue sky, ringed with the high reaching snowy peaks of the Pamirs bordering China. Camped by a magically turquoise lake. Woke to find the mirage faded to a silty brown pond. Three ragtag soldiers appear from the distance, two of them each carrying a small window pane. No water, no supplies. just too-small shoes and thick socks. Wrong-sized sneakers and holey jackets, they trudged four hours in thick, tattered clothes through the sand and heat to deliver these materials to the border post at the pass. Another hour to reach the post. No water or food on hand, they would turn and march back, a soldier's duty done for the day. Rode for hours along the empty landscape. A solitary soldier emerges from the Chinese side of the 3-meter high electric border fence. He calls to another man who is following 2 yaks across a sticky mud flat while Chris filters water from the clear flowing streamlet. The yaks disturb it, turning it into yet another of the unfilterable waters. We meet 2 and then 2 more cyclists. What we are doing is not so special, There are so many out on the circuit. But we are the only Americans- at least this year, so far. The others: German, Polish, British, Swiss, Dutch, Czech. In this sense, I'm proud to be an American. Up the pass. Not a hard one, but still 4200 meters high. At the top I know: some things are worth it. Kara Kul Lake, 15 miles away, huge in the distance. Why is it called black lake when it is purple and turqouise, brilliant azul, a gem in the desert? With a helmet, a modest descent of 52 kph. Chris's speedometer recorded 78.2. Some things, I don't want to know. Past the village of Kara Kul, on the way to camp, we turn back to fill up on fresh water at the village pump. Small children take turns jumping and hanging, moving the pump arm up and down. 2 stylish teenage girls come wheeling their 2 urns on a rickety metal wagon. Chris fills one of the urns and one girl pumps the other. Friendly young men with theirs and then 2 young soldiers stop to chat. In the end we stayed at a local homestay with a Tajik guide on his way to pick up his next group. We learn a lot about Tajikistan from him and our beautiful hosts. So far, so good. I only hope I'm up to all this physically. It is much harder than I imagined. How will I fare in Tibet? Along the way, it frequently occurs that you have to stop and show your passport yet again. Sometimes you get to sit down, sometimes you have to stand. There are easy-going guys who gently check your passport, and there are the wolves, trying to catch you without a registration stamp,which costs about 21dollars but carries a fine of $330 if you don't have it. All of the comings and goings through these checkpoints are carefully recorded in small notebooks, the kind kids use for school, decorated with Barbie or race cars or disco teens. As if all this weren't enough, we've had some outstanding checkpoint experiences. 12 kilometers out of Murgab, we descend into a narrow canyon. There's a checkpoint at the neck, just past the bridge. Full of flies. A shiny plastic mural poster of a liquid waterfall in a lush setting. Great contrast to our desert surroundings. Formalities without a hitch, and Chris goes down by the river to pump clean water. I futz with my bike and head down to join him. A soldier walks to the edge and beckons and calls out in Russian. "Come on, Chris," I say. "We've just been invited to lunch." Bowls of potato soup, a plate of sliced onions and delicious fresh made bread are spread out before us, the commander, and the half dozen recruits assigned to spend two years without holiday leave at this remote site. We are soon joined by Ian, a British guy who has spent the past 12 years touring by bike. In a dirty tee shirt and thin bike shorts he says that his only home is his cycle, apart from the few months he spends at a Bangkok guest house every winter. I hope I never get that extreme. Today was so weird. First, we're battling headwinds that came on strong at 8 am and only intensified so that by 2 o'clock, we were pedaling hard to go 6 miles an hour downhill. We did a great job of keeping our complaints to ourselves and putting our mettle to the pedals. We discussed the folly of spending precious days making so little progress in a landscape that was increasingly boring. The rocks and sand that called themselves the Pamirs made us wonder why others raved so highly about this route. The place is a desert. A high (over 13,000feet, dry, barren wasteland. It's amazing that every few hours we'd see goat droppings, and then soon, detect the thinnest sliver of green where these hardy animals could drink and graze. And then we'd see the sandstone hovel that no doubt was made livable and warm, which housed the children chasing the goats and the rest of the shepherds' family. This is truly living on the edge. But seeing one or two habitats a day, hearing only the wind in our heads, and thinking about all the more ridable places in the world got us to discussing the pros and cons of trying to hitch a ride. Granted, the five vehicles we'd seen so far were jammed packed already, but we wanted to consider the possibility. After all, what is the point of spending a large percentage of the available time making little progress with full effort, meeting no one and seeing little change in the landscape? After a well-needed Snickers break, we decided to hitch- should a car come by. We hadn't seen one in hours. After five minutes though, one came by. Packed of course, but they stopped and gave us encouragement- there were two jeeps just behind. We got back in the saddles and continued our slow forward progress- I think we'd finally covered 30 kilometers, when I saw something heading towards us in the distance. It was a big Toyota Land Cruiser with just one passenger and a tire on the roof rack. Not only that, but the young man who jumped out to greet us with a big smile was the same person we met yesterday- Zaire, a guide for a Central Asian tour company carrying a Japanese couple on tour. We'd spoken for about fifteen minutes on the road the day before, because the Japanese were also cyclists back home, and were considering doing an international tour in the future. They were curious about our route and gear etc. Zaire and the driver agreed to give us a lift to the Chinese stolovaya - cafe - where we were headed. But as the conversation got going and we were rolling, it turned out that they were driving down to the Wakhan Valley, our true Tajik destination. The great thing about travelling with Chris is he is very flexible and open minded. 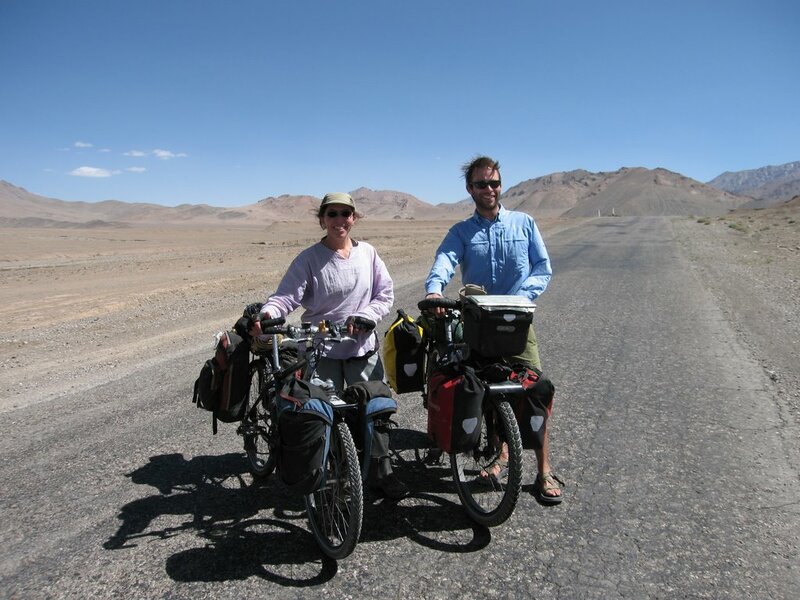 So four hours later we find ourselves outside of a guesthouse with Tajik speaking people watching us as we stand around a pile of panniers and helmets and tent and all, wondering what we should do. We just spent more money than we ever planned on the ride here. We offered to pay 25 dollars but the driver thought it should be 50. As we progressed along our planned route, we began to think it would be worth twice the price not to have to ride that way- especially into a wind tunnel. The scenery deteriorated, the mountains getting lower and more rounded, the roadside even less vegetated, if that were possible. Then, we got to the turnoff which leads down to the Wakhan Valley. Clearly,we were no longer in a inhabitable part of the planet. Gravel pit is a more likely description. There were, to be fair, some goreous, small salty lakes, but surrounded but sand and stone, and not even the textured colored sandstone that we'd been traveling with for the past few days. Just chunky broken rocks haphazardly strewn about the tilted walls of the giant sandbox. We reach the passport control point at the edge of the border zone. Our papers are all in order but they are now inaccessible. We had loaded our bikes on the Land Cruiser thinking it would be a 20 kilometer lift. Now the pannniers containing our documents were under the cycles where they were hastily loaded into the back. "Don't worry," Zaire said with a smile, holding a paper in his hand. "I have the permit for two tourists, one man and one woman." The driver handed this to the soldiers peering in the Toyota's windows at us. A friendly conversation ensued, Chris handed up three Marlboro Lights that he pulled from the last pack that we carried to give as gifts, and we drove on. "Let me see that paper?" I asked, curious about the details of the tourists we supposedly were. Chris was a 62 year-old Japanese guy. We were happy with our decision. With every twist and turn we felt even better about not spending any time riding through 3-inch deep sandpockets on a dry, windy desolate track. But then the mountains began to appear on the horizon. Or rather, far above the horizon. The completely white faces of the Hindu Kush peaks loomed above the high mountains, touching the sky. The river we'd been following somehow got our attention as it turned from a bobbing class II to a bouncing class III to a booming class IV before it diasppeared altogether in the depths of the narrowing canyon. Our road became a track that clung to the steep sides of the rising mountains. It contoured in and out around the deep cuts made by near-vertical water, finding its way down to the torrent far below in the canyon separating Tajikistan from Afghanistan. It was a pity that we did not get the chance to ride the gorge's edge and the rollercoaster hairpins down to the little village of Langar. But missing that was the price we paid to avoid 6 days of hard labor in the sand and salt mines on the road to Ishkashim. Now we are 117 kilometers away, resting with flying insects in the indescribable Ismaili Community House. Carpeted raised platforms surround the central floor. Walls are painted with symmetrical murals, the whole structure is made of intricately carved beams and posts. This creativity, the work of village youth. Young artisans in the community. The first of the Pamir homes we got to see. One of the main delights of traveling through this remote stretch of Tajikistan, at places just a stone's throw from the Afghani Wakhan Corridor, was the hospitality of the Pamiri people. At times it was difficult to travel more than 200 meters without being stopped by an invitation- for lunch, for dinner, for tea, for the night. We accepted one every day. We feasted at the home of Gulchekhra and her husband, Bek, who Chris befriended while I was photographing the large group sitting at the curb seeing their guests off on the mini-bus back to the central town. "Tea" turned into a 4-course meal. Their son then gave us a hour-long tour of the local millhouses. In these community stone huts, families bring their harvested and threshed wheat, grind it between hand-carved millstones by the power of the rushing flumes, load it into empty sacks, being careful to leave a large scoop of flour for the poor in the designated cubby on a shelf near the door, and then lash the full sack to the waiting donkey "taxi: for the slow trot home. Villages with a lot of water have several mills, and host families from neighboring settlements during the busy grinding season. Another day, Roma, a part-time law student in Bishkek, snatched us by the village pump, and brought us home for a two-hour tea. We left stuffed and bewildered by this family who filled our bags with fresh apricots and boiled eggs, satisfied by our sharing of pictures and stories of home. Chris met Marat at the Bibi Fatimah hot spring. It was worth the steep, 7-kilometer switch-back route to this unusual resort. Chilrden and young men helped me push my bike to the top, while Chris managed to peddle most of the way himself. An ancient fortress, like China's Great Wall, juts out toward Afghanistan atop a high ridge commanding a full view of enemy advance. The springs themselves were equally captivating: three hot waterfalls gently poured out from the side of the cave where old women and young girls bathed in the healing waters. In the men's pool, Chris held court with the dozen Tajiks bathing around him, and we left there with promises to visit Marat in his village the next day. We stayed in Boybar for two whole days. Marat, a sizable Judo champion, led us up to a naturally carbonated spring in a green fold in the dry, stony mountains where we lunched and drank and filled our bottles. He and his English-speaking wife gave us their cottage, came and cooked for us each morning and generally swamped us with generosity and hospitality. In turn, we bought a sheep for the family- them and four of Marat's five uncles living in Boybar. Eight of us packed into the jeep and we drove back with the docile dinner. It was horrific and moving to watch the uncles sharpen the knives, listen to the prayers of sacrifice, and see the bleeding sheep kick and writhe until his life bled out. It is possible to eat too much meat. We ended up spending an extra day in the district center of Ishkashim while Chris recovered. That's where we met Dr. Shirinbek and his son Olim, both surgeons, but from different eras. The younger, a laprosocpic surgeon, trained in Moscow, spoke good English and expects a better future for his wife and children. His father is a reknown thoracic surgeon who has endured a difficult past and survives in a difficult present. He lives with his wife, 2 kilometers up a steep track, withstanding the snowy, cold winters by huddling in the kitchen. The grandchildren who come in the summer to escape Dushanbe's heat and help with the milking and the washing go back to school in the capitalin the winter. Dr. Shirinbek treats patients at the hotspring sanatorium at the base of his hill where he runs a herbal apothecary. He explains that during the civil war after the break up of the Soviet Union, there was no medicine and no access to any. What he did have was books. Books on herbal treatments and how to prepare them. They were all in Russian and from them he learned. Using the surrounding plants, he built up a medicine chest and a practice, and he continued his work as a surgeon. The last outstanding hospitality was the most intense of all. Passing through a sleepy village east of Khorog, we saw smoke from an outdoor cooking fire and heard lively, loud music coming from a house just off the road. People waved and called and we hollered our hello's back. A few hundred meters along, we stopped at a roadside table to buy some halvah to add to our snack chest. Chatting with the seller, we understood that the music and smoke came from a wedding. We had expected to go to one while in Ishkashim, as the uncles from Boybar were planning to attend one and said we could be their guests. Alas, Chris was doubled over with meat overload and the uncles were very late as they spent several hours waiting to find enough gas for the journey, one plastic liter bottle full at a time. Tajik weddings last 2 or 3 days, so the next night, Chris and I attempted to go on our own, after the Boybar boys had already come and gone. We made it to the edge of the dark, music-laden driveway, but chickened out before crossing into the lighted festivity zone. Now that we had the chance, we decided to turn back and go. We were swamped by the two-hundred guests, the villagers who were invited to Day 2 of the wedding. The men were in one room and the women in another, sitting around an elaboraborate and symmetrical array of food. Nobody ate while they waited hours for the guests of honor to arrive. The bride and groom were more than 100 kilometers away, and in the meantime, Chris and I stole the spotlight. We were given the seats of honor and fed steaming plates of fresh meat, cool bowls of yogurt, tea and melon, and sweets and salad. The musicians came in from the courtyard where the grandmothers were intermittently cooking pilau and drumming, smiling and singing, and set up on the highest of the elevated floor levels in the open, central Pamiri house. Kolya, the one who invited us in, was hosting the party for the fatherless groom. He was a gregarious Master of Ceremonies, as he selected from the 100 seated females- marrieds on the left, singles on the right, who would dance. He himself was fluid and rhythmic on the floor, a contrast to Chris' amusing efforts when Kolya partnered him with a friend of his daughter's. We declined the vodka and the countless offers to stay the night and rode off into the twilight after three hours in the intimacy of this prototypical Pamiri family. Great read, I am about to do a similar route from Bishkek to Dushnabe. How hard was food to come by?